Yes, it seems that another Apple product is affected by an unexpected phenomenon, which will most likely require some official explanations. After last year’s iPhone 6 Plus was accused of bending way to easy while being held in a pocket, it looks the Apple Watch, in its stainless steel version, to be more specific, is prone to getting scratched way to easy on the sides. According to Crave Online, the issue was brought to light by a Twitter user, who posted a couple of images with his brand new device, bought on April 24th, the exact official launch day. Of course, he was far from being happy at seeing that his brand new Apple Watch, for which he payed at least $549, has a couple of scratches on the sides. And as you can see, they’re pretty noticeable! 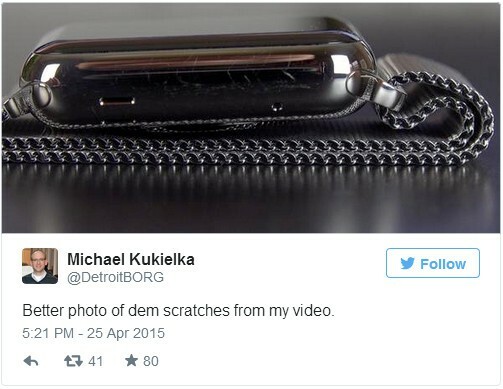 Still, if you’re planning to buy a stainless steel Apple Watch, you don’t need to worry that much about scratches. As long as they’re not that deep, you can get rid of them using a simple metal polish, which you can find in a lot of shops. No need to take it back to the Apple Store and start complaining. Finally, we don’t ignore the possibility of seeing even more similar Apple Watch issues in the near future, but we’re pretty sure that they won’t generate as much buzz as last year’s #Bendgate did.